History tells us that World War II united Americans, but as in other conflicts it was soon back to politics as usual. Nancy Beck Young argues that the illusion of cooperative congressional behavior actually masked internecine party warfare over the New Deal. Young takes a close look at Congress during the most consensual war in American history to show how its members fought intense battles over issues ranging from economic regulation to social policies. Her book highlights the extent of—and reasons for—liberal successes and failures, while challenging assumptions that conservatives had gained control of legislative politics by the early 1940s. It focuses on the role of moderates in modern American politics, arguing that they, not conservatives, determined the outcomes in key policy debates and also established the methods for liberal reform that would dominate national politics until the early 1970s. 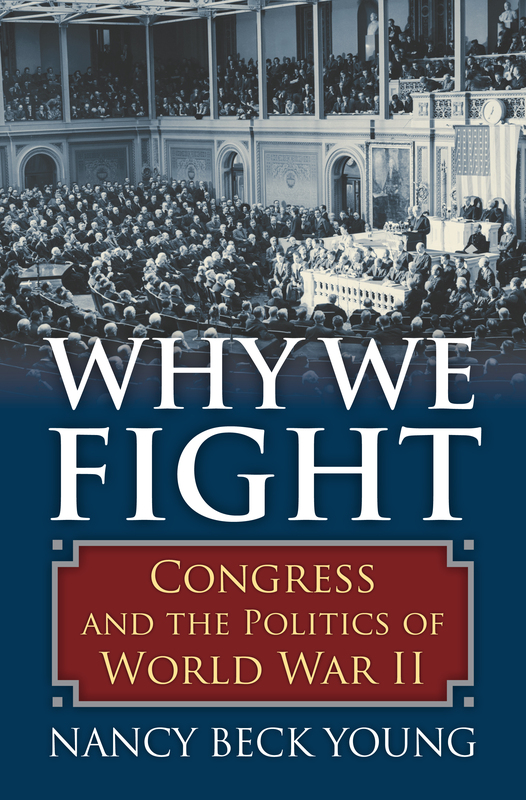 Why We Fight—which refers as much to the conflicts between lawmakers as to war propaganda films of Frank Capra—unravels the tangle of congressional politics, governance, and policy formation in what was the defining decade of the twentieth century. It demonstrates the fragility of wartime liberalism, the nuances of partisanship, and the reasons for a bifurcated record on economic and social justice policy, revealing difficulties in passing necessary wartime measures while exposing racial conservatism too powerful for the moderate-liberal coalition to overcome. Young shows that scaling back on certain domestic reforms was an essential compromise liberals and moderates made in order to institutionalize the New Deal economic order. Some programs were rejected-including the Civilian Conservation Corps, the National Youth Administration, and the Works Progress Administration-while others like the Wagner Act and economic regulation were institutionalized. But on other issues, such as refugee policy, racial discrimination, and hunting communist spies, the discord proved insurmountable. This wartime political dynamic established the dominant patterns for national politics through the remainder of the century. Impeccably researched, Young's study shows that we cannot fully appreciate the nuances of American politics after World War II without careful explication of how the legislative branch redefined the New Deal in the decade following its creation. Nancy Beck Young is Professor and Chair of the Department of History at the University of Houston and author of Lou Henry Hoover: Activist First Lady; Wright Patman: Populism, Liberalism, and the American Dream; and, with Lewis L. Gould, Texas, Her Texas: The Life and Times of Frances Goff.